Attached to the Ambient Lights controller is a button which can be turned left or right and pressed. With these movements, the user can set any color available in the HSV color space. The controller's firmware implements some kind of "HSV menu". Pressing the button switches between H-, S- and V-mode where you can adjust the values for Hue, Saturation and Brightness (=Value). Turning the button adjusts the currently selected value - turning right increases it, turning left decreases it. Holding the button down while turning it makes the value increase or decrease faster. Long-pressing the button toggles the auto-mode. In auto-mode the current S- and V-values will stay the same but the color will change by steadily moving to the right on the color-wheel (Hue will be increased). Just long-press the button again to switch back to manual mode. The video shows the Ambient Lights being controlled by the Android client application running on a HTC Desire. The app requires Android 2.1+ and uses the device's Bluetooth connection. With the current version it is possible to select the wanted color using a color wheel for Hue and Saturation and a color bar for brightness. 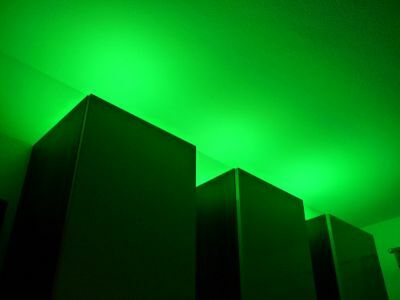 When a color is selected, the command is directly sent to the Ambient Lights controller. It is also possible to send raw commands using the edit field. The Android client application just implements the serial communication protocol supported by the Ambient Lights controller. The following table shows the commands available. Commands are sent without any line breaks etc. Serial speed is 19200bauds. cRRRGGGBBB Sets color using RGB-values. dHHHSSSVVV Sets color using HSV-values. Activates auto-mode with automatic Hue-alteration. Saturation and Brightness will stay the same. Makes the controller send the current controller state. All values are sent as string-formatted integer values. Activates or deactivates verbose mode. The zip-file contains schematics, the controller's firmware (Arduino sketch) and a simple python script to set the colors via serial interface from your PC (wxPython needed). The file "Ambient_Lights_schematic_firmware_and_test_client.zip" contains the content described above. It's the first revision of the hard- and software and works just as described in the article above. I now added a new revision of it all. 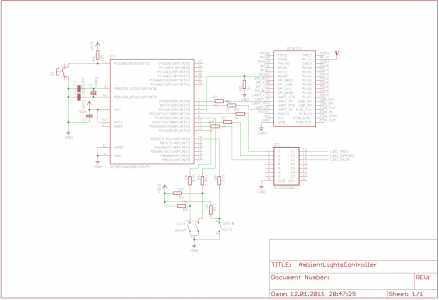 The file "Ambient_Lights_schematic_and_firmware_rev2.zip" contains schematics and firmware source code (Arduino) for this revision 2. Since I changed the serial protocol, the python client from rev1 will not work. I'll add the documentation for it soon. In the meantime, please use the APK which is also provided now. The Android App is not the best piece of software you may have had on your Droid - but it kind of works ;-). The AmbientLights.apk only works with the rev2 firmware! as described in the article, I use the BTM-112 module. It's easy as pie: The BTM is connected to the serial rx/tx pins of the microcontroller. To connect from your Android device, refer to the Android API reference. Tell me please, what did you use for UUID to connect BTM-112 with Android? 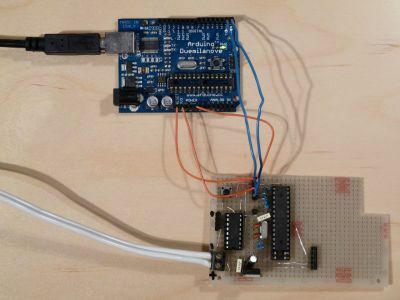 "Hint: If you are connecting to a Bluetooth serial board then try using the well-known SPP UUID 00001101-0000-1000-8000-00805F9B34FB." device is of type BluetoothDevice. Thank you very much!) The second method is the only that works with my HTC Wildfire too. since the Android application only works with this controller, it'll be useless without it. Are you planning on building one? I'll try to find the time to upload the whole package containing schematics, Arduino source code and the Android sources. I'm good hand working but not good enough in electronic I would like to make a small light with 3 common RGB 10w led and 3 common daylight 10w. 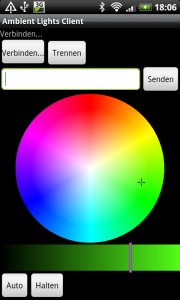 The idea is to be able to programm (with an android phone)a color storable (or if not too complicate, possibilities to have 2 or 3 presets stored)on the unit then have a general dimmable on the unit. Your project is so close to what I'm looking for. Dear project author!Thank You for this great device.This is the best project that I found in the internet.I have long wanted to build RGB controller and control it via Bluetooth interface.I have a question - where i can download Android(only android?) client software which is used by you in this project.If it's possible send me please to my email address. Would be very thankful!Thank you! Hiya, been looking for something just like this. Is your android app in good enough condition to distribute yet? Looks brilliant - haven't found any other apps that are this good looking and functional! I wish you an happy new year and thanks for your job. thank you. A happy new year to you as well! I read your article. Seems like a good project you're on! Especially the additional 6000K white LED is a good idea. For the moment, I try to find information and hope to make some prototype one day. It's very important to be an open project, I don't want to make any money on this. Hi, please could You tell me where to get ASKModulator.h ? Your program references to it but nothing found on google and inside v2 zip. This looks great, by far the most professional project of its type. However I can't find ASKModulator.h either, it's referenced in one place as local and another as part of a library?